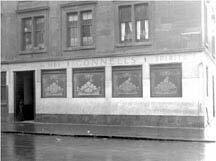 Connell’s bar was situated at the corner of McLean Street and Craigiehall Street off Paisley Road West. In 1887 James Lindsay acquired a licence for this old pub, James was one of Glasgow’s well known publicans, he owned the Sou Wester Vaults on Bridge Street, and another on Blackburn Street, and the Arlington Bar, 130 Woodlands Road. James Lindsay was also an agent for the “The Palace” which was a brewery company in Edinburgh. United Breweries was registered as a limited company on 14th December 1889 and took over four Edinburgh brewing businesses, Robert Disher & Co, Edinburgh & Leith Brewery, Ritchie & Son Bell’s Brewery, Robin MacMillan & Co Summerhall Brewery and David Nicolson Palace Brewery at a purchase price of £320.000.United Breweries went into Liquidation around 1934. James Lindsay started out in a measurer’s office with the firm of W S K Wemyss, he later became associated with James Neil, who was representing United Breweries Ltd, James acted as indoor manager in addition to travelling in Glasgow and Ayrshire, it was due to ill health that he entered into the retail trade. James died in 1902, his son then took control of the business. Mr Lindsay continued as licensee until the late 1930s. In 1937 Alexander Palfrey took over the pub, he also had licensed premises at 2 Cornwall Street. Robert Palfrey was licensee in the 1950s and continued so until the 60s. The pub was demolished in the early 1960s.